Join us in this GroupX challenge to attend 15 classes in 25 days. Successfully complete the challenge and win a prize. 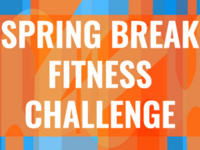 BONUS – Complete an additional 3 classes the week of March 4-8 and be entered to win exclusive spring break fitness challenge prizes!